I am dreaming about a quiet dinner for two for Valentine’s Day, oh, who is kidding, I dream about any quiet dinner for two these days! Actually I think my little granddaughters would appreciate a Valentine’s table, I just will do it with a little more casual feel. Here in Florida the weather is rarely so cold that we can’t dine on the front porch. Our wrap around front porch is one of our favorite places to spend time. I absolutely LOVE these plates. I got them many, many years ago at the outlets in Reading, Pennsylvania. It didn’t seem like these rose decorated plates needed much embellishment to communicate the idea of Valentine’s day other than some additional roses. I topped my dinner plates with pretty embossed heart shaped salad plates and tied a red satin ribbon around my pink napkins. The grocery store roses in pink, red and lavender were really all of the decoration my table needed, AND had room for. Gold colored flatware from West Elm seemed like the perfect metallic to add to my table styling. I went a little fun with these glitter heart wine glasses, a Home Goods discovery! I love all of the textures accented with my white pierced candle trays from Ikea that I used as chargers. Do you set a special table for Valentine’s Day? What about just for a special dinner for two? Porch dining in February…sigh! 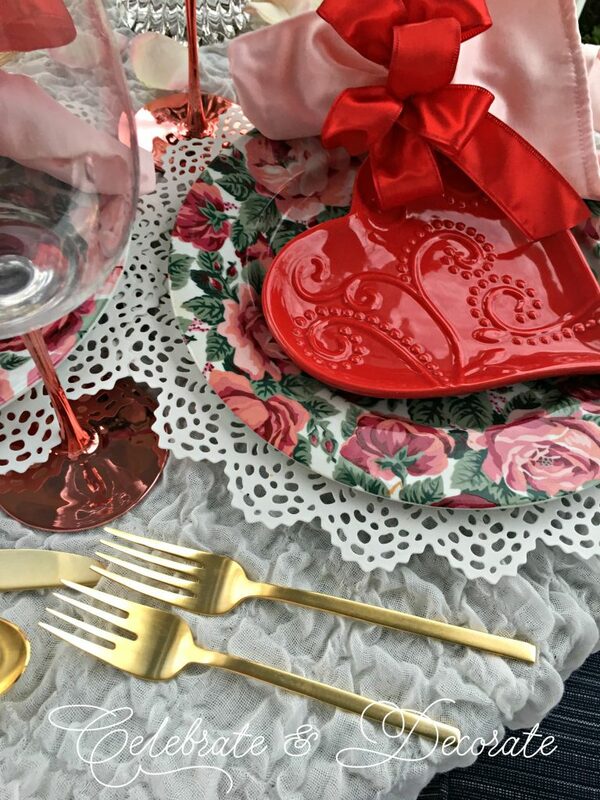 The floral plates are beautiful and speak of a sweet Valentine’s celebration! The heart-shaped plates and bouquet of roses add more beauty! 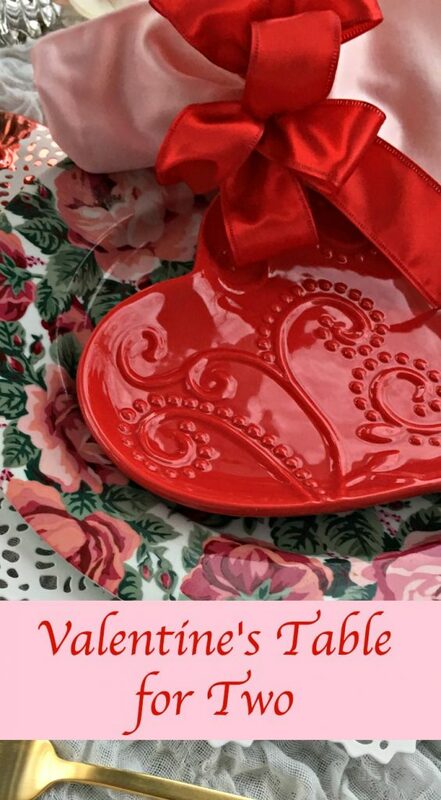 Thank you for organizing another fabulous blog hop and Happy Valentine’s! You’re right, Chloe, those plates need very little embellishment – they’re knockouts! But the heart plates you added for simple charm are perfect, and just a lush bow such as you’ve done on the napkin really works. This is a great mix of pink and red hues (not all of them work like this), and to say I’m just a little jealous over porch sitting in February is an understatement. Chloe, thank you organizing another successful round of themed tables. You’re a gem in the blogging world! Chloe, a lot of punch for two – wow I love what u did on a small table. Envious of both those gorgeous rose plates and the heart embellished glasses. Love your new picture, Chloe! Thank you for organizing us. I think Mary, described the process well! lol! I agree with Rita about being jealous about porch dining in February! Love your rosy plates with the heart accent and clever chargers. I have not heard about candle trays before. Your fresh roses are stunning and I like the three colors that work so well with your plates! Lovely table for your special Valentine! 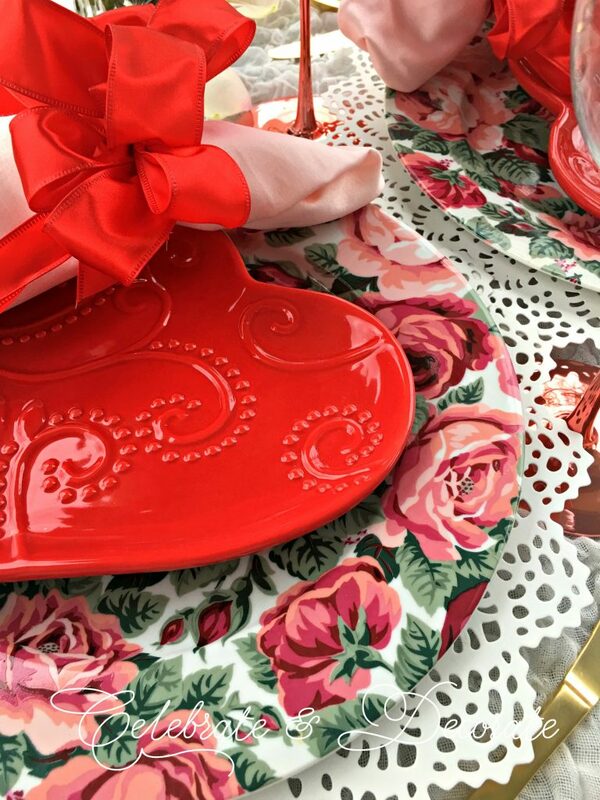 Gorgeous, Chloe, those red heart plates are just perfect over the rose plates. Thank you for organizing this hop! Have a wonderful Valentine’s day. This is so sweet and romantic Chloe! I envy the fact that you can be outside to do this! The cabbage rose plates are beatiful and of course the real roses are too! Those a cute red heart plates and stemware! 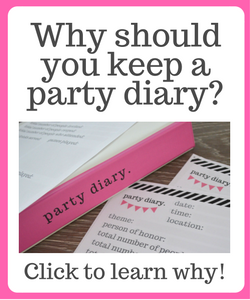 Thanks for sponsoring the blog hop! Wishing you a Happy Valentine’s Day! Beautiful Chloe, and the roses are gorgeous! You are so clever and I know hubby was pleased at the romantic dinner for two on the front porch. Thanks for hosting the blog hop! Very very nice, Chloe! 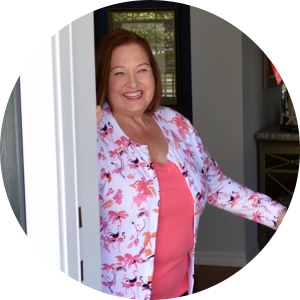 I love all entertaining on a lovely southern porch! And thanks so much for organizing this blog hop! So pretty!!! And the napkins are over the top fabulous!! I just love everything Chloe, the roses mimicked on the plates, the red heart salad plate, the cozy bistro table for 2, it’s all adorable! Thank you for such a great hop this week! Chloe, thank you so much for your work in organizing the Valentine’s Day Blog Hop. It is truly a fun experience and appreciated. Your Valentine’s Day table on the front porch is such a lovely setting to have a cozy conversation. Your rose plates are certainly beautiful and unique and is such a lovely inspiration piece for the rest of the table. The white cut-out plates adds a special woman’s touch and daintiness to the table. You know that it conveys a lot of special love. 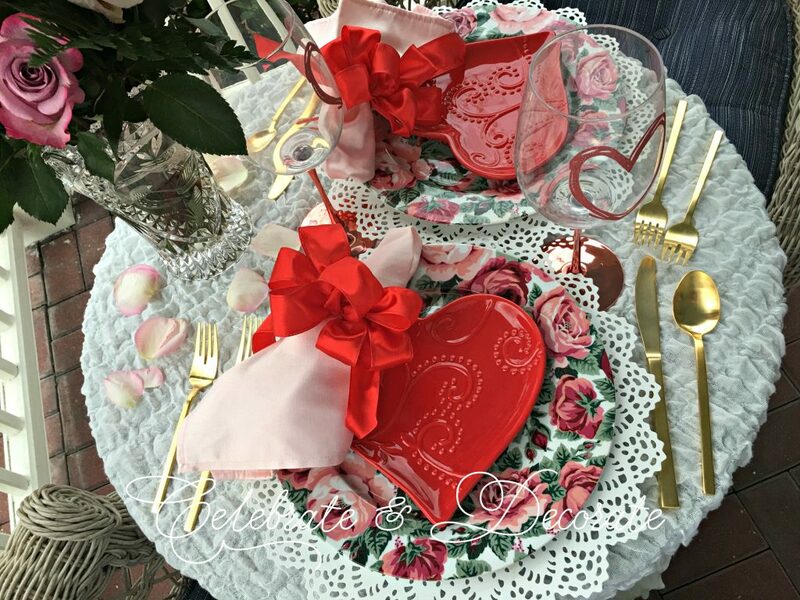 The roses and bows and heart shaped stemware makes it all come together to make a romantic setting. Chloe, I adore those heart~shaped salad plates. So cute. The wine glasses are really cute, too. 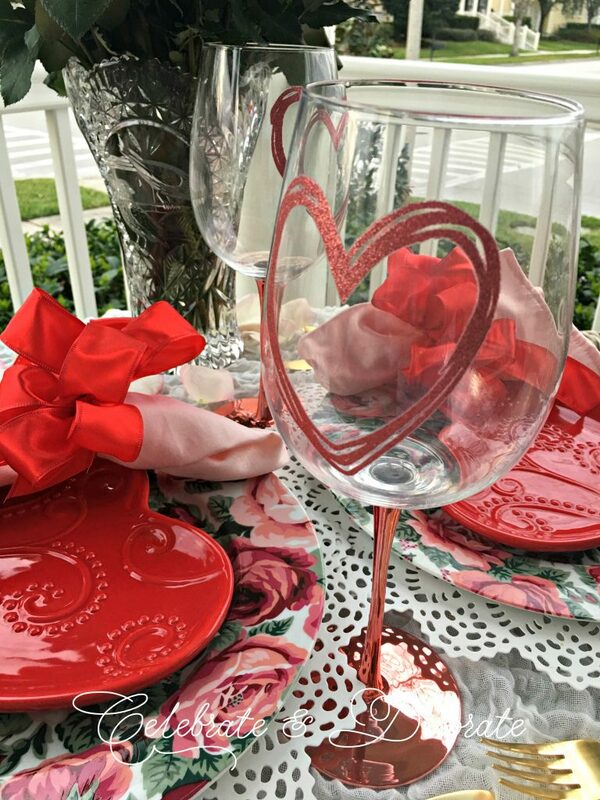 Yours may be the first ever Valentine’s table on the front porch ~ What a sweet idea. And the weather cooperated! Thanks so much for hosting and being our fearless leader. Great job and great hop. Hugs. 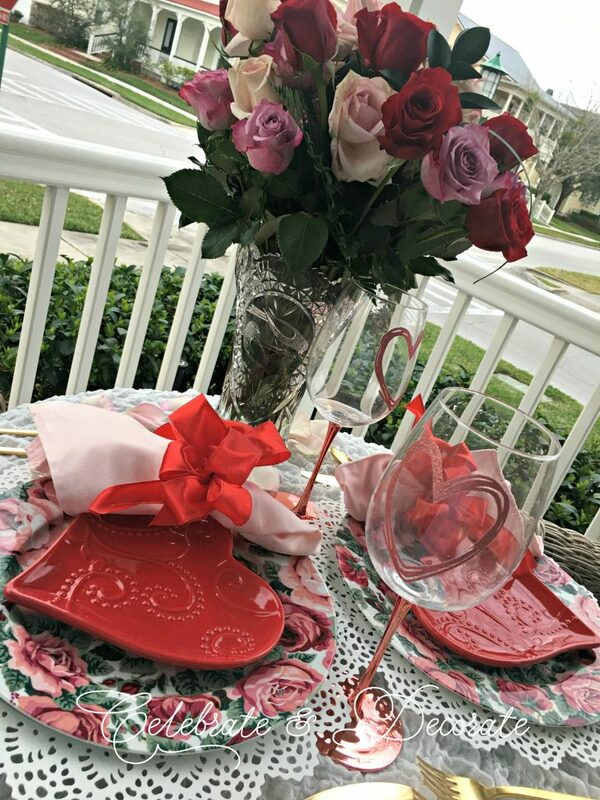 I am so jealous that you can set such a fabulous Valentine table outside on your porch – We have 7 inches of snow on our porch!! Your table looks perfect. 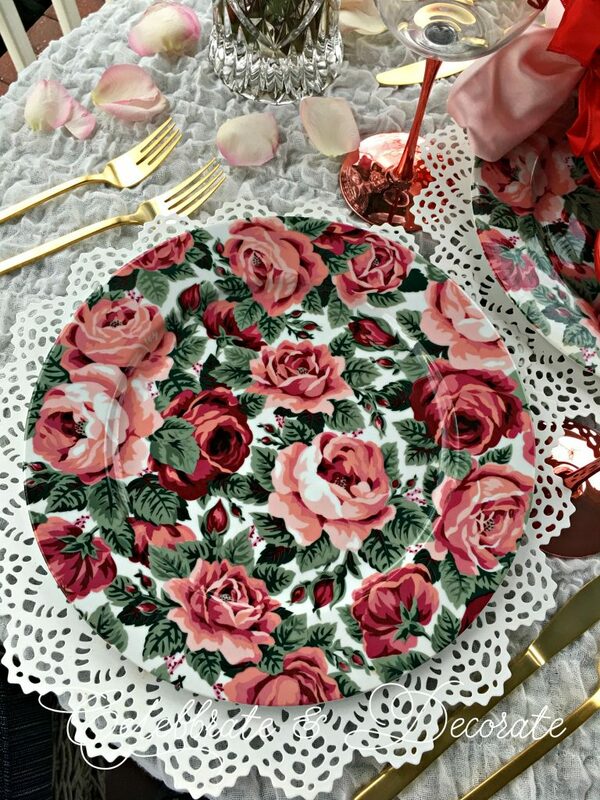 Those plates are beautiful and your right – those roses are all you really need to accessories the the plates, and what a fabulous accessory roses make!!! Thank you so much for all the work you did pulling us all together for yet another fun and creative hop!! Thank you so much for taking the time to organize and run another beautiful hop! Your table is, as always, beautiful! So many cute hearts, and just the right amount of pink and red – perfection! I love your table with the pretty red roses and rose plate and the cuties red heart plates so special for a lovely Valentines Day! I love that your v-day table is outside. Where we are in Texas it’s still cold and it all still looks dead and brown. Such a great idea and the table looks lovely! Hopped over from Blue Sky at Home. So glad I did! Chloe, Your porch is the perfect spot for the two of you to celebrate Valentine’s Day! You’re going to make your neighbors jealous! You scored a great buy with your rose plates. It’s amazing how you were able to decorate your small table so completely for the big day, without it looking crowded. Very beautiful, my friend! Thank you again, for organizing and putting on this blog hop. I so enjoyed it! Happy Valentine’s Day! Thank you ever so much for gathering this group of bloggers together. I have enjoyed this blog hop so much and I have been inspired by every single post. A romantic table for two on the front porch in February…I love it! Top it off with red roses, heart shaped plates and there is magic in the air. So pretty and so sweet! Chloe, thanks for holding this Valentine Bog Hop. Lots of beautiful tablescapes and ideas. I just picked up two of those red heart shaped plates like you have. Just love them. The rose and heart plates are pretty and so perfect for this table. You did an excellent job with a small space to work on. Chloe, your floral plates are lovely. How special to sit on your porch and enjoy a romantic meal together. The roses are beautiful. Love the heart shaped plates as well as the heart goblets. True romance Chloe. 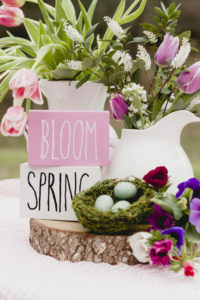 Thanks so much for organizing this fun Romantic Tablescape blog hop. Such a fantastic setting for a romantic Valentine’s meal and definitely one that wouldn’t be happening in our neck of the woods which makes it all the more dreamy to me! 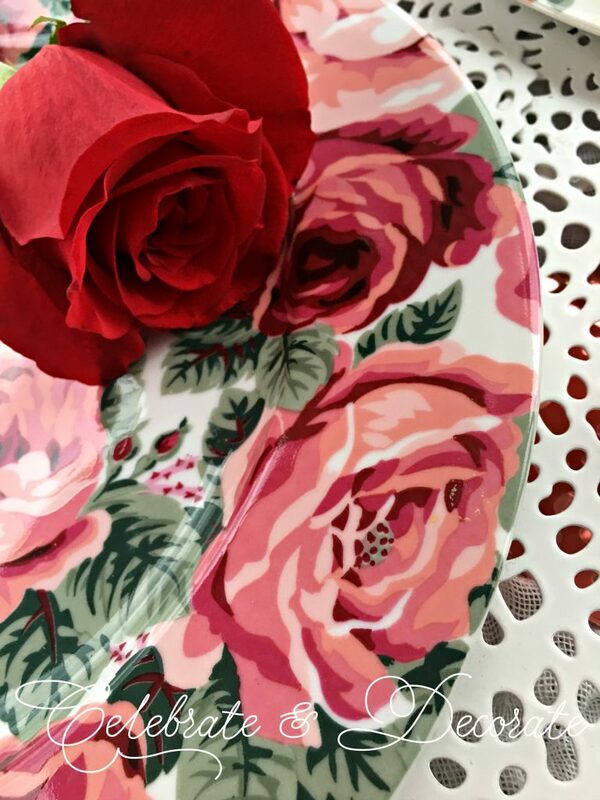 Beautiful roses make the perfect centerpiece for Valentine’s and coordinate wonderfully with those gorgeous plates – love the rose one and the heart shaped one! The heart-swirls on the stemware fit right in and that golden flatware adds a touch of drama. Using those lace-look candle plates as chargers is the “icing on the cake” – so pretty! As always, Chloe you’ve done an outstanding job at putting together another fun blog hop for us to participate in and enjoy – thank you so very much for all your efforts! I’m sure it takes a lot of organization and planning which is much appreciated. Happy Valentine’s Day to you and your hubby! Sweet Chloe, this table is absolutely beautiful! Those floral plates are so pretty, and the red bows as napkin rings add such a lovely touch. I’m a little jealous that you have nice weather to be able to dine outside. Our weather in Oklahoma has been terribly cold! I have been traveling with my hubby this week for work, and we are stranded in Arkansas because there is an ice storm in Oklahoma. Hopefully, we will get to go home tomorrow! Thanks again, for allowing me to be a part of your blog hop. I am so grateful to be a part of your group. Take care, and enjoy the rest of your weekend!!! Chloe, your alfresco Valentine’s tablescape is a romantic dream! Floral and heart shaped plates are a beautiful combination, and roses bouquet is gorgeous! It’s always inspiring to blog hop with you! Chloe, what a lovely and romantic Valentine’s tablescape you put together. I am in love with those beautiful dishes! The roses look so pretty on the table! 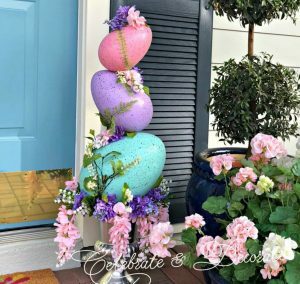 Thank you so much for hosting this fun blog hop! So beautiful. I can see my husband and I setting at a fabulous table such as this one tomorrow . Thank you! Valentine perfection! Your plates are stunning, and I just love the napkins tied in a big red bow. I am just a tad jealous that the weather is good enough to sit outside! Still freezing here in Canada 🙂 Thank you for hosting another fabulous tablescape blog hop! I always look forward to creating my own, but visiting all of the talented ladies is so much fun and inspirational! Thank you so much Maureen. I know I have nice weather right now, but alas, I will be inside in the air conditioning come July and August! Chloe, this is gorgeous, as is the setting! 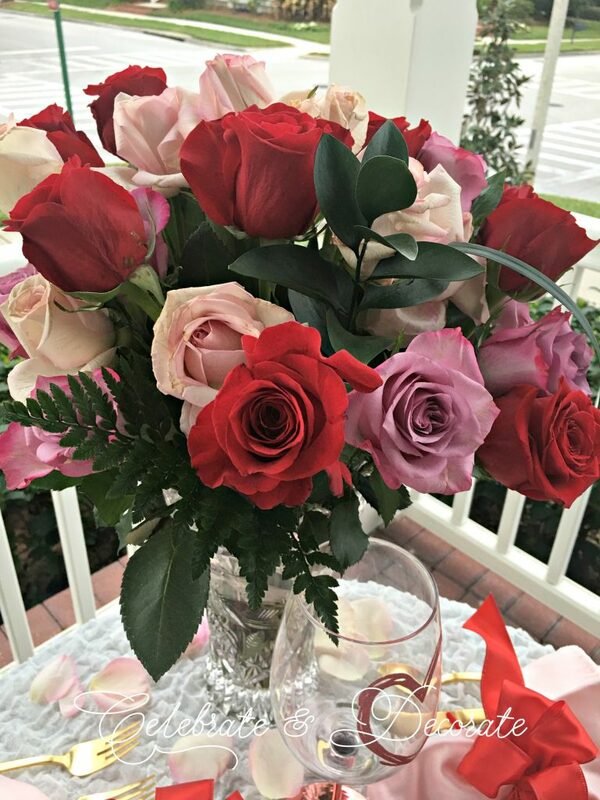 I love the combination of the red, pink and mauve (the mauve is always my favorite) roses – so striking and you’re absolutely right, that’s all the table needed! Your dinnerware is also just perfect for the season without being over the top. Love this! Thank you so much for your kind words, Kim. We really enjoy dining out on the porch, and setting a pretty table with flowers makes it extra special!